I have been wanting to read the stories of Stephanie Grace Whitson for awhile, and felt this was a good author to start with as I become familiar with INSPY by FaithWords. Being an avid reader of Historical Fiction (including within the INSPY fiction market) I was delighted she focuses on this genre to tell her stories! 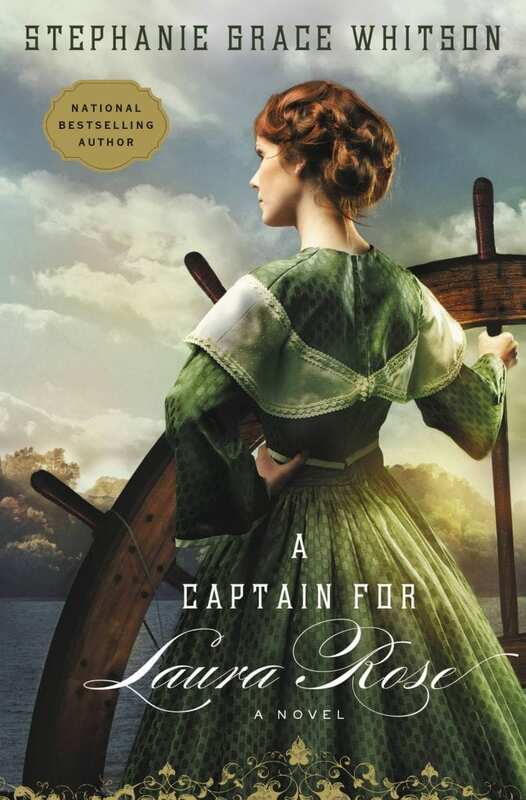 I received a complimentary copy of “A Captain for Laura Rose” direct from the publisher FaithWords (an imprint of Hachette Book Group Inc.) in exchange for an honest review. I did not receive compensation for my opinions or thoughts shared herein. Ever since I first picked up a copy of Frontier Lady by Judith Pella, I have been truly inspired by historicals written by INSPY authors! Little did I realise this story would spin itself into a trilogy, as I do have a copy of Stoner’s Crossing but not of the final story Warrior’s Song. I have only read Frontier Lady as a result and looking back, this is a prime example of my beginning roots as a ‘book blogger’ as I remember gushing about this book to such a level of joy, my family told me my ‘memories’ of the story felt as if they had actually sat down to read the story for themselves! Even then, as a young girl I was finding my voice to talk about stories and how those stories gave me such visual joy in reading them! INSPY fiction has been in my life for such a long time, it’s hard to think back on a moment I was not reading it, as I have previously disclosed my joy in finding the Cooper Kids Adventure series, inasmuch as the fact I have roamed through INSPY and Mainstream markets since I became an avid reader somewhere in my youth – between the angst of learning to read (as a dyslexic reader) and finding my niches along the way by the time I hit Fourth Grade when my teacher refused to believe I couldn’t find enjoyment out of the written word. Mum and Da encouraged me to read whatever interested me, whilst encouraging my Indie spirit to seek out book shoppes that were not major chains… this helped twofold, as Indies were more lax about children in their stores who were seeking a ‘next read’ but needed time to sort that out and they had a larger inventory of books in which to seek! I also had a healthy curiosity of the fiction I’d find at a local Christian Book Store – where I’d spend hours looking through the adult fiction sections before I stumbled across the Mandie series and Cooper Kids Adventures. From there, I jumped straight into adult INSPY fiction as I found the Children’s Lit sections a bit too limiting – hence Judith Pella! The collective works of Dee Henderson soon followed suit, by the by! I hadn’t realised it until I became a book blogger three years ago, I have the tendency to soak inside the historical past moreso than the Contemporary offerings throughout the fiction realms! Should have noted this I suppose along the way, but I read so very diversely across genres, it’s hard to pin-point me down to any particular ‘genre’ or style of literature at any given moment! Laughs. If you’ve visited my Story Vault by Genre you’d understand immediately! However, for a bit of a short history about my appreciation for INSPY Fiction, look towards my 70 Authors Challenge which this year I am making enroads towards whittling down a bit to where more entries are listed! When it comes to the works by Ms Whitson, I felt like she was approaching the historical dramas with story-lines that not only appealed to my historical passion of interests, but with a touch of what I seek when I look towards INSPY writers who are crafting historical stories! Since I’ve become a book blogger, you might have seen my enthused joy in reading historicals by Susan Meissner (time slip historical – A Fall of Marigolds); Carolyn Steele (Willow Springs & Soda Springs) and Carla Kelly (Softly Falling & Summer Campaign). It has been an honour of mine to pick up the search for inspiring historical novelists since I first discovered Judith Pella and Lois Gladys Leppard (Mandie series) – I had a sense Ms Whitson might become the next author I add to my ‘short list’ of personal favourites; hence why I was wicked happy FaithWords gave me the pleasure of selecting two of her novels to begin reading as I become a reviewer of theirs and join their blogger team! I had to smile when I saw Whitson had given her lead character such a charmingly strong name but also, that supposedly her father had christened the steamboat with her name to honour his love for his daughter. I felt it was a small way for her father to make amends to her regarding her true love (piloting a steamboat) knowing full well her life was going to take a few difficult turns if she tried to proceed with that kind of lifestyle. Her father raised her well, but sometimes society and the generation your bourne inside can dictate what can be permissible in regards to careers. I had hoped there might be a loophole revealled somewhere along the way and/or out of sheer desperation, Laura Rose could command her family’s steamboat! It’s hard to see a character so befit a layer of angst just because their passion fell outside the etiquette of their time. I nearly burst out laughing when I could well imagine the shocking look on Laura Rose’s face when her mother informed her that despite her carefulness to mask the ordour and condition of her brother Joseph’s drunken state, she was very much aware of her son’s misfortune! Truly, some of the best lines and scenes portraying a flustered daughter and a distraught mother are right at the ending of Chapter Two! This spoke such volumes about how close the family was to each other and how unexpectedly brilliant Whitson had written the White family! I liked seeing Laura Rose taken off-guard as it gave her a new layer of curiosity as she felt she was on top of everything and yet, not nearly as well as she hoped! Raised with a strength of faith, Laura Rose was guided by her parents to lean on her faith whenever life took a turning that felt upturnt and uncertain. With gentle wisdom, fervent prayer and a heart held fast to a hope that would not dislodge, Laura Rose lived with a practicality about steamboating whilst anchoured by her faith which strengthened her resolve. This is what I appreciated seeing in this INSPY story most – how her living faith was drawn close to her heart as she needed it and how softly Whitson included her spirituality to set the undertone of the novel itself. I felt instantly engaged in the plight facing Laura Rose – she’s easy to warm too, as she relates her family’s affairs and her long-held dreams as easily as chattering with you over a cuppa tea! Laura Rose has a hankering to commandeer her family’s steamboat business – where it flourishes (or rather did!) on the Missouri River – except for one slight problem: in her generation, women were not allowed to be licenced to operate the steamboat! Imagine!? She had a sharp mind for business, blessed by her father and she was a bit fit to be tied the sole person in charge of keeping her family afloat had a wandering eye and a zeal for entertainment that might run contrary to ‘above board behaviour’; at least by the standards of a family whose work ethic kept them running freight up one of the hardest rivers to navigate! Counter-current to the financial uncertainty of Laura Rose’s family, we meet Adele whose been given a hard hand in life to be dealt – the cast-off half sister of Laura Rose’s brother’s friend Finn, of whom is only meant to be kept on at their family’s home until she’s of age to inherit and/or is married to a man of their choosing. It’s quite a hard reality for a girl of eighteen to carry on her shoulders, which is why Adele felt like an interesting character to me – she’s upfront about how she’s never known what it is like to be part of a family who truly cared for each other, but also how she would rather live humbly than be begotten to half-kin who would rather she went elsewhere. Her plight reminded me of the children in foster care whom long for a forever family and oft-times do not succeed in finding one. There are many ways in which children can grow up without a loving environment, and being carted off to a relation merely due to not being of age to live independently has to be one of the hardest paths to walk. Adele’s innocence and willingness to seek out a better life for herself is what endears her spirit to your heart. Joseph’s friend Finn is suffering from what we now call PTSD from returning home from the battlefield unprepared to handle his memories and resume his civilian life. His guilt is heavy and his burden is difficult, which is why he turnt to drink originally. He is forthright in his frailties but completely uncertain how to pursue the life he wants to lead. His heart is on the river, same as Joseph’s – as all three of the river pilots (Laura Rose included!) only feel the most comfortable on the water. It calls to them and the water runs in their veins; it’s a life they trust and one that they itch to revive. Finding out about the anguish on Finn’s soul, you can start to understand his behaviour and motivations better; a small glimmer of what Laura Rose might have to come to understand down the road. She only sees Finn and Joseph on the surface of their lives, not realising what lies within a layer behind where they hide their emotional hearts. Even Joseph has self-doubt he’s struggling against – as he tries to step into his father’s shoes and command a business he was not ready to take-over. My, my what tides can soon be changed! Laura Rose finds herself put into a position she never felt she’d earn (in her lifetime) even though she felt as if she’d gained the respect of being a pilot from her family. When her brother falls ill, her mother encourages her to take-over the reins of the Laura Rose, especially in the wake of reality realising Finn was a no-show to command the steamer himself! There are a few unresolved questions churning her mind (as well as in Joseph’s and her mother’s) but those are put to aside to find the courage to boldly believe in herself when the family’s keep is on the line! I was hoping Whitson would set this up to happen – Laura Rose is on the fringes of gaining her self-confidence as she’s still a bit uncertain about her skills – thus, imagine my happiness seeing this twist of fate written into the story! With sudden alacrity of her circumstances altered beyond what she can rightly believe, Laura Rose takes a brace of bravery out of the poetic words her mother once taught her as they awaited the return of her father and brother; back when the war was raging and the steamboat continued to prevail. I hadn’t seen a foreshadow of this happening, but I wasn’t too quickened to shock either – the 19th Century was stricken by illnesses that caught like quickfire and were unable to be put out except through death. Your heart tightens when you realise the magnitude of what Laura Rose is facing but blessedly there are small kernels of hope flickering outside the numbing silence of her sorrow. Whitson digs deep into how far men and women will go to find redemption and restitution for what has happened to them, to such an extent as to think through each step of the process to come through something they first feel is overwhelming stacked against them. I liked how she purposely gave Finn a strong sister with a fortitude of insight towards the rights women had to lead their own lives and to be guided by where their hearts aligned their passions. She was the unexpected champion and heroine of the close-knit cast of characters, as her guiding voice of reason rang true and strong throughout the chapters. Finn like most men who had returned scared emotionally and psychologically took a bit longer to sort out their next step – his choices altered even further out of a tragic accident. Yet all the while, Whitson is etching inside her narrative how true strength of faith and true courage of conviction to overcome life’s adversities is worth the patience to see through til the end. Whitson has given us such a strong story built around looking at things from multiple perspectives and threading everything through a measure of faith – where reality and spirituality collide to embolden us with what is necessary to carry on. Before Memorial Day, I will be reading my second Whitson novel Daughter of the Regiment, however, before I duck back inside the lovely breadth of a Whitson historical, I will be re-emerging into the Contemporary INSPY world of small towne Hope within the pages of A Place Called Hope by Philip Gulley! I love small towne fiction and this one sounded especially keen as it felt as if the community was quite quirky and that’s just how I love my ‘small townes’ to be in fiction! This novel will be my first reading by Center Street the compliment to FaithWords and Jericho Books! As an aside on behalf of Hachette Book Group Inc. and their imprints, I wanted to thank them for providing such an excellent resource as to keep their book catalogues on Edelweiss and provide the incredible resources they do via their Bloggers Portal to help book bloggers blog about the books they are selecting to review. They truly are a blessing to book bloggers, as they aide you directly with the Press Materials you need for your blog whilst giving you keen information about upcoming releases! Steamboats. Family Drama. River Life.